IMAGE ABOVE: Charles Marville, Haut de la rue Champlain (vue prise à droit) (Top of the rue Champlain) (View to the Right) (twentieth arrondissement), 1877–78, albumen print from collodion negative. Musée Carnavalet, Paris. Image © Charles Marville / Musée Carnavalet / Roger-Viollet. Charles Marville, Charles Delahaye, c. 1857, lightly albumenized salted paper print from paper negative, National Gallery of Art, Washington, Diana and Mallory Walker Fund. Beginning in 1852 and continuing for more than two decades, the French emperor Napoleon III, along with his apparatchik—Baron Haussmann, the Prefect of the Seine—embarked on a massive public works program to regularize and sanitize the medieval agglomeration that was Paris. The best-known aspect of this program was the circulatory network of new, straight boulevards that was surgically inserted into the fabric of the old city. 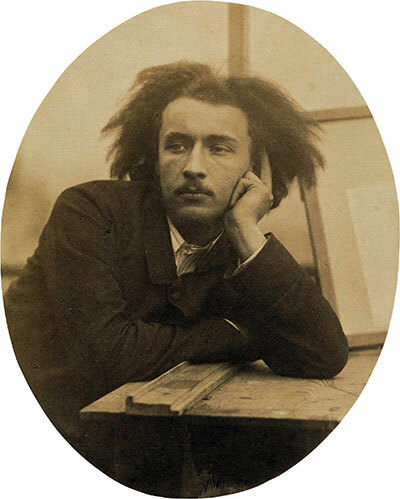 Not for nothing was Haussmann dubbed the “Attila of the straight line” by a contemporary critic. 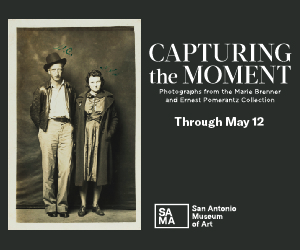 Commissioned in 1862 as the official photographer of Paris, Charles Marville—the subject of a traveling retrospective making its final stop at the Museum of Fine Arts, Houston—had a front-row seat to Napoleon III’s profound transformation of the city. Although Marville’s first major photography project for Napoleon III was to document the recently-created Bois de Boulogne, a public park created on the site of a former royal hunting ground just outside the city limits in 1858, the portfolios recording the changing city comprise the meat of this exhibition. The first of these, “Old Paris,” contained 425 photographs documenting the physical appearance of the oldest sections of the city that were about to be destroyed. Because of the long exposure times necessary for the primitive film he was using, Marville often photographed in the early morning before the streets were occupied. The intimate and shadowy, yet deserted spaces, along with the somewhat dark exposures, lend an air of poignant melancholy to many of these images. And while Haussmann complained of the filth and disarray in these districts, they seem strangely orderly and neat in the photos selected for the show. Whether Marville, whose personality remains enigmatic due to a lack of biographical information, intended any sort of critique of loss is unknown. However, one of the most incisive images shows Marville and his assistants in 1867 posing in front of the aristocratic stone townhouse that was their studio. It was demolished later the same year to make way for a new street. Other portfolios that Marville completed during these years depicted the actual demolition of the urban fabric. Here we see buildings missing walls and men and work horses standing next to piles of rubble that eerily anticipate not only the destruction of so many European cities by firebombing during World War II, but also the “slum” clearance schemes that wrought havoc on so many American cities during the postwar years. A separate portfolio documents the creation of the Paris Opera and its connecting Avenue de l’Opéra that allows the dramatic views of the building that we so appreciate today. According to the wall texts, this was the “most spectacular building project undertaken by Baron Haussmann,” which seems to mean that it involved the most property confiscation and demolition. Despite being interrupted by a revolution and a war, the Opera and its avenue were finally completed shortly before Paris hosted the Exposition Universelle in 1878. 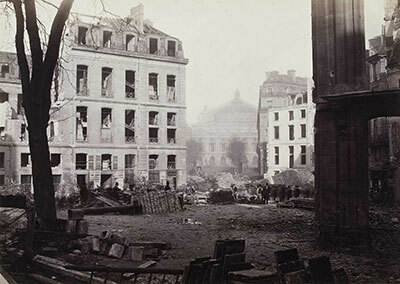 Charles Marville, Percement de l’avenue de l’Opéra (Construction of the avenue de l’Opéra), December 1876, albumen print from collodion negative, Musée Carnavalet, Paris. Image © Charles Marville / Musée Carnavalet / Roger-Viollet. When Napoleon III annexed eleven communes surrounding Paris in 1860, essentially doubling the city’s size, Marville photographed its new peripheral districts. It was in these spaces that many of the working class people who had been displaced by the ongoing reconfiguration of the historic city core had resettled. These images depict not idyllic, leafy suburbs but a mostly a desolate setting of shanties and dirt with views of domes and spires of various Parisian monuments on the horizon. Finally, as construction progressed, Marville was commissioned to photograph many of the newly installed public amenities along the boulevards, including street lights, kiosks, Morris columns, and pissoirs. Today, Paris is the “city of light” and a true delight for tourists thanks to the efforts of Haussmann and Napoleon III, but at what cost? 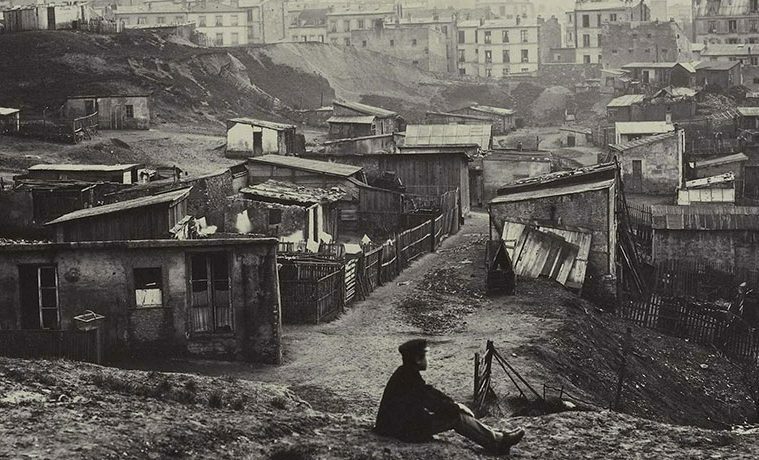 These haunting images recorded by Charles Marville give pause and make one wonder if there could not have been some way to incorporate these ancient districts more sensitively into a city that was still modern, clean, and well-lit. Ben Koush is an architect in Houston. He writes for Cite Magazine and Texas Architect.